Fresh cut Christmas greens are essential and traditional ingredients in creating the ambiance of the holiday season. Fresh trees, wreaths, swags, and roping add a special touch to your decorating outside and inside as reminders of the great outdoors. Since evergreen greens are presumed to be tough, they are often neglected. In all the wealth of care and handling information, Christmas greens seem to be somewhat overlooked. Actually, their general requirements are nearly identical to the other fresh cut flowers and foliage. When cared for properly their beauty can be prolonged. 1. Greenery and wreaths will last the longest if they are kept cool. Avoid using them near heat vents, fireplaces or in the direct sunlight indoors. 2. Keeping cut greens and wreaths where it is humid will extend their freshness. 3. When possible, mist cut greenery and wreaths to replenish lost moisture and keep them fresh. 4. 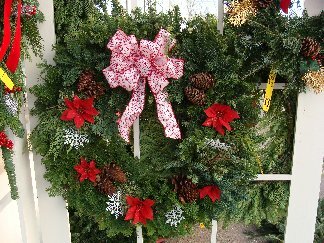 Wreaths and greenery can be sprayed with an anti-desiccant such as WiltPruf. It will seal in moisture and help them last longer. 5. Store greenery and wreaths in a shady area outdoors where they will be exposed to rain or snow as long as possible before bringing them indoors. 6. If cut greenery are used in flower boxes or planters that contain soil, make a fresh cut on the ends of the branches going into the soil so they can absorb available moisture. 7. Replace greens before needle drop becomes too severe. Everyone can relate to the joy of working with fresh Christmas greens. This excitement can fade when these same greens become dull, or loose their needles and fragrance. Giving special attention to the care and handling of this product will help keep the Christmas spirit alive and prolong the enjoyment of this traditional symbol of a beautiful holiday season. Fresh greens are available for sale. Stop by and have a look at our pre-made selection or place a custom order. i love the smell of fresh flowers, they are really soothing..
We agree! Thank you for your comment.